The end of June is one of the best times of the year. The sun rises early and sets late, pharmacy the 4th of July is just around the corner and black mission figs are finally in season! 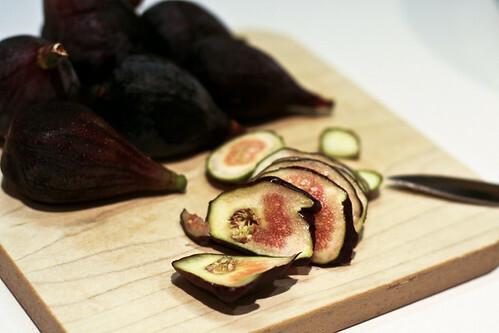 I love figs, and while I’ll never pass up dried figs, there’s nothing like a fresh one. I think people are scared off my their weird appearance, or maybe they’re just traumatized by Fig Newtons. Whatever the case, nobody seems to buy them at my local grocery store, which just leaves more for me. I love them caramelized, grilled, drizzled with honey and especially on a pizza. They add just enough sweetness to complement the salty prosciutto and cheese without being cloying. Delicious! Go get them now before they’re gone for the summer. A tip on storing them: Keep them in the fridge. They grow mold quickly if it’s hot an humid out. If you’ve got a pizza stone, preheat it. Otherwise, preheat a cookie sheet in a 500° oven. Once your stone or cookie sheet are preheated and the oven’s nice and hot (I like to leave it on for at least a half hour before I put the pizza in), roll or stretch your dough out until it’s nice and thin. Sprinkle the cornmeal on the pizza stone and then assemble your toppings. Since you’ve preheated the stone or cookie sheet, the bottom of the dough will begin cooking. This is a good thing since it’ll keep your pizza from being soggy in the middle. Layer your sliced figs, then drizzle them with the olive oil and honey. Sprinkle with the black pepper, then add the cheeses, making sure to distribute them evenly. Bake for 10 – 12 minutes, or until the cheese is brown and bubbly. Remove to a cutting board, layer with the prosciutto, slice and serve! Mix all the dry ingredients in a big bowl, mixing well. Then add the wet ingredients and mix together into a big clump. Thanks! I think it’s one of my top 5 favorite pizzas. And that’s saying a lot! Thanks Nan! Have a GREAT 4th! ttfn300 – That’s the perfect remedy! Just keep sprinkling with flour and kneading it until it’s no longer sticky. Your pizza looks great! Hey there… I’m going to try this on the grill tonight and will let you know how we fare! Thanks for the recipe. I’ll cook tomorrow night for a cocktail party and I thing this is gonna be soooo good for an appetizer.Thx so much for posting it. 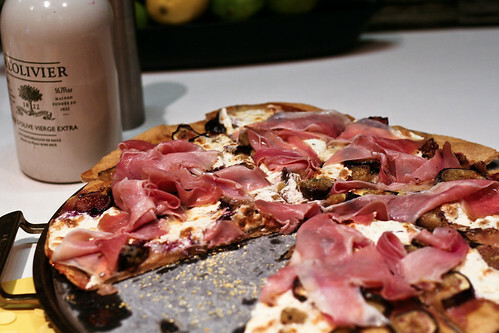 came across this last night looking for fig pizza combinations, and this was perfect. we also added some pine nuts for fun. thank you!! Made a variation of this last week and it was delicious! Instead of bleu cheese I used gorgonzola and I topped the whole thing with some spicy arugula and shaved parm. Delicious! Oh my goodness! This way amazing! I used a little more blue cheese and really good olive oil. I also made the pizza dough using the recipe given. So simple, so sweet, so delicious! I throughly plan on using this recipe over and over again. Also, it was even better with arugula on top. It was a simple way to add something a little healthier that I never would have thought of.